When data security is the most important part of your workflow, VaultDisk® Secure SSD drives are the fastest, and most secure SSD solution. VaultDisk® Secure is a removable FIPS 140-2 Self Encrypting Mini-2.5″ SATA SSD drive for use with Dell systems that have removable drive support, so no tools are needed to remove and lock away the boot drive. The removable SSD creates the ability to cold swap your boot drive in seconds, saving man hours and securing all critical data. FIPS 140-2 Level 2 hardware encryption ensures that the firmware integrity, encryption technology and physical security of the SSD all meet the requirements set forth by the Federal Information Processing Standard of the National Institute of Standards & Technology (NIST). Secure Firmware: Solid secure firmware features secure digital signatures and boot-time attestation which help to protect storage devices against low-level attacks. Advanced Encryption: Built-in Advanced Encryption Standard (AES) 256-bit hardware encryption engine (XTS mode). Instant Scramble Erase: The ability to complete sanitization of all data on the SSD in under 2 seconds, simplifying device retirement or redeployment. 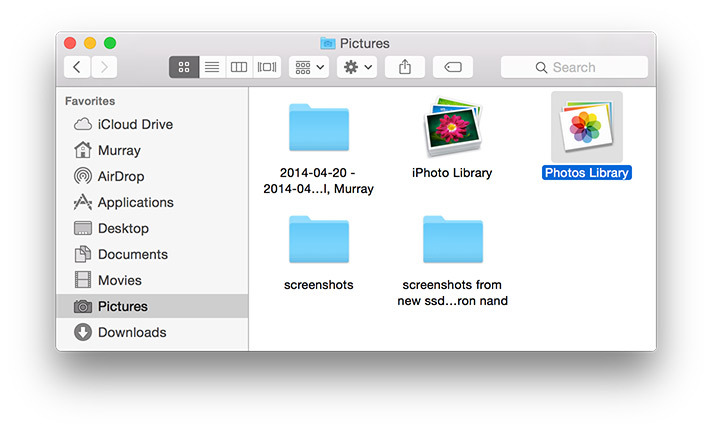 Secure data workflow: Easily remove and securely store, clone, or swap system boot disks. VaultDisk® offers a completely new way to secure and transport data between network classifications. Easily distinguish and swap boot drives allowing you to jump from Windows to a Linux boot drive in seconds. Worldwide PC shipments totaled 62.1 million units in the second quarter of 2018, a 1.4 percent increase from the second quarter of 2017, according to preliminary results by Gartner, Inc. This is the first quarter of year-over-year global PC shipment growth since the first quarter of 2012. All regions experienced some growth compared with a year ago. While the results are a positive result for the PC industry, Gartner analysts said this sign of market stability is not enough to declare a PC industry recovery just yet. While Dell’s competitors have shown PC shipment declines periodically in the past two years, Dell’s shipments did not decline during this time because of its strong focus on growth areas, especially in the commercial segment, as well as cutting off unprofitable businesses. In the U.S. PC market, the industry returned to growth after six consecutive quarters of shipment declines. In the second quarter of 2018, U.S. PC shipments totaled 14.5 million units, a 1.7 percent increase from the same period last year (see Table 2). HP Inc. continued to be the market leader in the U.S., but Dell closed the gap, as Dell’s U.S. PC shipments increased 7.2 percent. *Lenovo’s results include Fujitsu’s units starting in 2Q18 to reflect the joint venture that closed in May 2018. In the professional data security and storage industry, there are few institutions where the stakes are higher than with the federal government. When a branch was recently in need of a removable data solution for a new mobile workstation platform, they consulted with DIGISTOR. The application was specified as follows: they required a device that was extremely powerful, yet mobile and flexible enough to allow for a multi-threaded application to perform optimally across multiple networks with varying security levels. An industry standard for many data professionals, the Dell Precision 7520 is a powerful mobile workstation—but even the 7520 has its limits. While these workstations perform at a very high level, accessing the onboard SSD was time consuming. Removing and transporting the drives was causing mechanical failures in the field. In addition, the client needed these devices to easily swap in and out of multiple operating systems, security levels, and networks. As administrators transferred between secure and unsecured networks, training networks, operating networks and other environments, a fast, secure and flexible need became clear. The optimal solution would have to be an easily accessible, powerful, and secure SSD that was removable and interchangeable in seconds, and could plug in and adapt to a range different devices and networks. DIGISTOR partnered exclusively with Dell to create a new solution, the type of which the market has very rarely seen. Our VaultDisk® Removable SSD could be installed into Dell’s existing mobile line of Precision Workstation Laptops. VaultDisk® Secure Removable SSD easily and safely ejects from the DIGISTOR patented entry system. One of the virtues of this client using the VaultDisk Removable SSD is that it allows for multiple users, operating systems, and security levels to utilize a single platform. A product with this level of power, security and flexibility didn’t previously exist. Another benefit is that the system is incredibly easy to use, saving the user space, money and time. This solution enables the entire hard drive to be removed with the same ease and convenience as an older generation might have interchanged floppy disks. The VaultDisk system also creates efficiency between multiple users logging into workstations. Just how fast is the VaultDisk® Removable boot drive SSD solution? Watch below for a comparison. The DIGISTOR team seamlessly integrated VaultDisk® across the Dell Precision Mobile Workstation line, giving the client a mobile, secure and conveniently removable solution. DIGISTOR has released VaultDisk drives in a variety of network ID color schemes to allow for easy detection and use across multiple networks. Dell is now marketing this new breed of solution on an OEM basis and is winning designs across the Fed Sector. We are excited to introduce you to DIGISTOR’s updated website and blog. We’ve come a long way since we got our start in 2001, when our family started this business to provide digital archiving and data storage products to industrial and global OEM customers. Over the past 15 years, DIGISTOR has become a leading innovator, manufacturer and distributor of industrial-grade flash storage products, secure storage products and digital-video solutions, and today we serve customers around the world in industries such as Law Enforcement, Media, and Entertainment, Medical, Professional Video, Security/Surveillance, and Military. We always welcome your comments, feedback or ideas so please be sure to connect with us on social media. We will have a lot to share in the coming weeks and months ahead. As the 2016 New Year unfolds, the demand for secure data storage will increase at every level within the IT stack. According to the 2015 Cyber Defense Report, 70% of organizations have been compromised by a successful data breach within the last 12-months. With a zero-trust data protection mantra, new pervasive data security solutions will emerge to touch applications, endpoints, networks and storage collectively. Encryption technology alone, when keys are managed by employees in both on-premise and Cloud environments, is not an adequate cyber-attack deterrent, while control over data location and redundancy are key to maintaining compliance, data privacy and security across global, heterogeneous infrastructures. To keep up with the burgeoning big-data deluge, organizations continue to move larger workloads into unified/virtualized environments, both on-premise and cloud. Many have already successfully deployed a variety of high-performance hybrid data storage solutions into the data center landscape. In a recently released survey by ActualTech Media, many of these enterprises have begun incorporating flash-based storage in their data centers, ie. 41% use on-premise HDD only; 9% are using off-premise/Cloud only; while 50% of respondents are already using some type of on-premise flash-based storage (3% all-flash, 47% hybrid mix flash/HDD). With all the significant benefits virtualization brings to the IT infrastructure, one factor has inhibited wide-scale legacy application virtualization, and that is performance. Bandwidth, IOPS and latency, are standard storage performance metrics typically measured in milliseconds, with flash drives specs within fractions-of-a-millisecond. As data storage is usually the IT infrastructure latency bottleneck, minimizing latency is a key objective for faster I/O completions and faster transaction processing. As latency has a direct impact on VM performance in virtualized environments, an adoption of solid-state storage incorporating flash-caching hardware and software is enabling very low latencies while simultaneously helping to minimize network bandwidth bottlenecks. Flash SSD advantages include higher IOPS, reduced cooling, reduced power and lower failure rates than standard HDD. 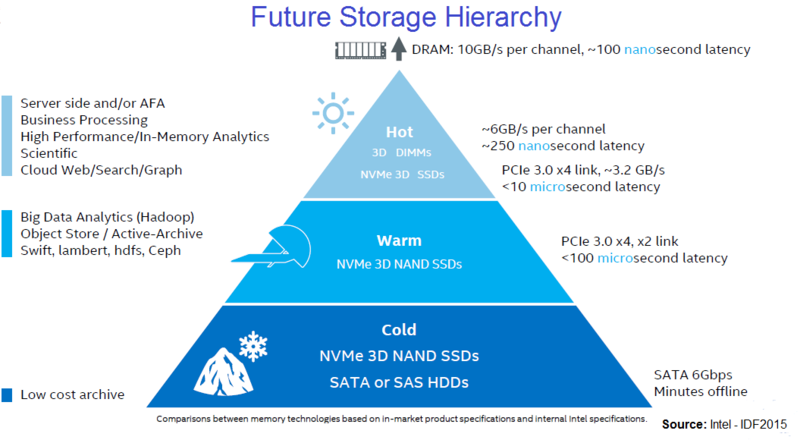 Although flash SSD storage costs are rapidly declining and are still a 2x factor higher than HDD per terabyte (depending on TCO variables), a combined hybrid SSD/HDD automated tiered storage solution offers compelling metrics that IT professionals are finding both acceptable and in-budget. SSD-based data storage technology provides true business value by enabling faster access to information and real-time analytics. A hybrid SSD/HDD solution enables IT to balance cost and performance to meet their unique application and SLA requirements. Which flash-based SSD solution is truly right for your environment? There are many factors to consider when comparing industrial-grade versus commercial-grade flash storage devices. Industrial-grade utilizes SLC (Single Level Cell) NAND versus commercial-grade MLC (Multi Level Cell) as the data storage medium. Based on voltage, SLC records only a single value (0-1, on-off), where MLC can store up to four values (00, 01, 10 or 11) in two-bits of data. SLC NAND has 20-30x more endurance cycles over MLC NAND, better data retention life and extreme temperature functionality. The pros and cons of HDD compared to SSD can be paired down to a handful of variables, ie. availability, capacity, durability, encryption, environment (humidity/temperature), fragmentation, heat/BTU’s produced, mtbf/failure-rate, noise, physical form-factor, power requirements, price, shock/vibration, speed, warranty, and write-protection capabilities. Write-protection at the SSD and HDD firmware level, not just the physical data and file system level, is one of the key differentiators when comparing secure SSD/HDD storage technology solutions. There are only a small number of manufacturers offering such functionality and price is presently a premium variable of consideration. HDD are vulnerable to magnetic pulse and x-ray, making automated replication to alternate HDD, storage arrays and locations a necessity, driving up cost while still ultimately susceptible to data loss. SSD is impervious to their effects making it not only a viable tier-0 high-performance data cache solution, but potentially a new long-term active-archive storage tier solution. New ISO and NIST secure storage regulatory compliance can also be a factor when evaluating which flash-based solution will best fit your requirements, as well as DOD 5220, EU-DPD, HIPPA, FedRamp, IRIC 106, NIST FIPS/FISMA/SP-800, NSA 130-2, PCI/DSS, and many others. For more in-depth technical comparisons and product information, give Digistor a call today at 800-816-1886 or email us at sales@digistor.com. Data storage security has quickly become both a hot-topic and a new budget line item for CTO/CIO’s in 2015, both here in the US and around the world. An organization’s data is most often its most valued asset, while keeping it stored safely is increasingly both a commercial and legal imperative. Managing not only how data is stored but how to securely access and communicate it across a wide range of media and services is the fundamental building block of information assurance. Regulatory compliance has driven a variety of storage practices over the years to guarantee information assurance, but one of the most sweeping new international reforms comes from the pending new EU General Data Protection Regulation (GDPR) being adopted by all 28 of the EU member states. Substantial changes in scope to embrace globalization of cloud computing, social networks and data-breeches, brings in new levels of enforcement and heavy fines that will forever shake up EU data protection practices and privacy guidelines. Often the security associated with data storage systems and supporting infrastructure has been overlooked due to basic misunderstanding of the inherent risks to data storage ecosystems, leading to data risk compromised from a wide variety of events. The new NIST-sponsored Cyber-Physical Systems (CPS) framework was initiated to define key characteristics to better manage development and implementation of both the Industrial Internet and Internet of Things (IoT) physical computational and data storage components across multiple smart application domains including energy, healthcare, law enforcement, manufacturing and transportation. The brand new ISO/IEC 27040:2015 defines data storage-centric security as application of physical, technical and administrative controls to protect storage systems and infrastructure against unauthorized disclosure, modification or destruction. These controls can be compensatory, corrective, detective, deterrent, preventive or recovery in nature. The rapid adoption of complex software-defined storage systems (SDS), ie. the uniting of compute, networking, storage, and virtualization into a hyper-converged storage solution, became a top data center trend impacting both data security and data recovery strategies in 2015. Although simplifying rapid provisioning, ease of implementation and redundancy, while providing significant saving in cost, power and space, data storage-centric security remains a significant gap in the SDS infrastructure. Due to superior accessibility, capacity-on-demand, flexibility and lower overall IT costs compared to legacy on-line compute and data storage methodologies, cloud computing has quickly become a mainstay on a worldwide basis. Yet, just like traditional online compute/storage methodologies, cloud computing has its own set of unique data security issues. Mitigating risks before and throughout a cloud adoption is the number one imperative among CIO/CISO/DPO’s, as they transition applications and data to the cloud. The decision to move to the cloud depends on the sensitivity of the data/application, service-level-agreement and overall cloud security infrastructure, and ultimately does the business value offset the risks? 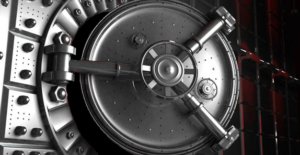 In a recently released 2016 Trend Micro Security report, despite the need for Data Protection Officers (DPO) or a Chief Information Security Officer (CISO), less than 50% of enterprise organizations will have one, or a budget for them, by the end of 2016. With the EU GPDR directive, coupled with the ISO 27040 data security standard mandating a significantly higher degree of data protection, a DPO/CISO job slot designated solely to ensure the integrity of data within and outside the enterprise is a wise investment. With this higher degree of awareness, legislation and technology around data storage-centric security, we will begin to see a proactive shift in the enterprise policies, practices and strategies that will bring effective protection to the storage infrastructure. Public safety is now a concern of every commercial enterprise, municipality, school and university. High-resolution video surveillance and law enforcement body-worn cameras (BWC) are generating more long-term video storage requirements than ever before. Enterprise IT must be able to balance a budget for both cameras and a secure infrastructure that enables easy, yet secure, data access. A wide variety of new BWC, chain-of-custody, evidence management and surveillance technology solutions are blossoming as new local, state and federal budget resources are being made available in 2016.
rays shipped were SED capable. SED offer FIPS 140-2 compliant security without all the overhead of a software-based encryption schema, coupled with self-describing encryption key management capability, making it a valued component in the secure data storage infrastructure. Over the next several months throughout 2016, we will delve more deeply into the practical application of specific secure storage technologies, why and how to put security directly into the physical storage technology, advantages and disadvantages between specific data storage technology, cost analysis and more. Stay Tuned.. The stock Xbox One claims 500GB of storage, but in reality it only has 364.8GB of usable space. Each Blu-ray disc game you play has to be completely installed on the internal hard drive in order to play it – these games run between 20GB and 40GB on average! Additionally with Xbox One Backwards Compatibility and the plethora of Xbox Live Games with Gold pouring in each month, that storage is probably getting a bit thin right about now. Microsoft has made it very clear it voids your warranty to open the Xbox and tinker with the internal hard drive. So how can you get more gaming storage with minimal effort (and without voiding the warranty)? DIGISTOR has a series of gaming hard drives that are fully compatible with Xbox One! How much storage can you add? Up to 2TB, which is four times the advertised capacity of the stock 500GB system. The drives are small, whisper quiet, and don’t need to be plugged into the wall. Simply plug in the USB 3.0 drive into the back or side of your Xbox One and you can set the DIGISTOR drive as the new default location to install all your games, saves, and profile content if desired. Another benefit of storing your games on a small pocket sized USB 3.0 drive is you can grab your DIGISTOR HDD and bring all the pre-installed game content to your friends house and play on their console without needing to download the content again, or re-install from the disc (although you will need to bring the disc as well for security purposes). Take a look at our gaming hard drives section of our website and grab one for yourself before you are alerted you’re out of space! Having to look for some of the highest quality Blu-ray media on the planet can be a daunting task for individuals and organizations. The notion that buying direct from “the source” as the only reliable means is often on the top of their search to-do list. While having dedicated countless hours sifting through forums on where the best media can be purchased, looking tirelessly through overseas shopping sites, can always be worthy of a certain amount of bragging rights when the goods is finally in hand. Others may rely solely on eBay and Amazon sellers from overseas as their middleman. But where else can these consumers turn to that simply want the best media and what makes their exhaustive search so worthwhile? Most, if not all, are searching for media made in Japan over any other origin because of innate quality control system and choice of materials. Being all-too-familiar that ordering from Japanese companies and its affiliates does not guarantee they will receive the genuine discs, that were made in Japan, and not “from Japan but made somewhere else,” as some merchants would have you believe. To add more complications to the matter, ordering certain package quantities could also be a factor. For example, buying the individual pack (or the 5 pack jewel case) will be a product made in Japan. However, ordering the 10 pack jewel case or the 10 or 25 pack spindles, will get you a product made in China, Singapore, etc. To them, data integrity, performance, and longevity of their stored digital assets is very important, so naturally only the best quality media will do. After all, Japanese made recordable media strikes a chord with users, as they have proven themselves time and time again. After the hunt is over the fun part comes into play. 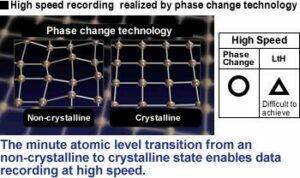 Phase-change recording technology, which has undergone continuous refinement over the years, instantaneously changes the atomic arrangement within the recording layer from a noncrystalline (amorphous) phase to a crystalline phase when it is exposed to a high-temperature laser beam. 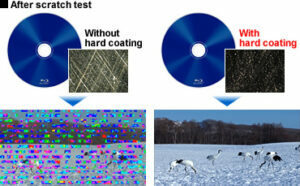 The phase-change recording technology enables reliable, high-speed recording. 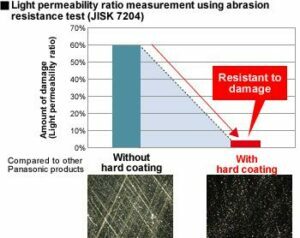 A hard coating technology makes DIGISTOR BDs highly resistant to scratches. Scratches are fatal to recording discs. 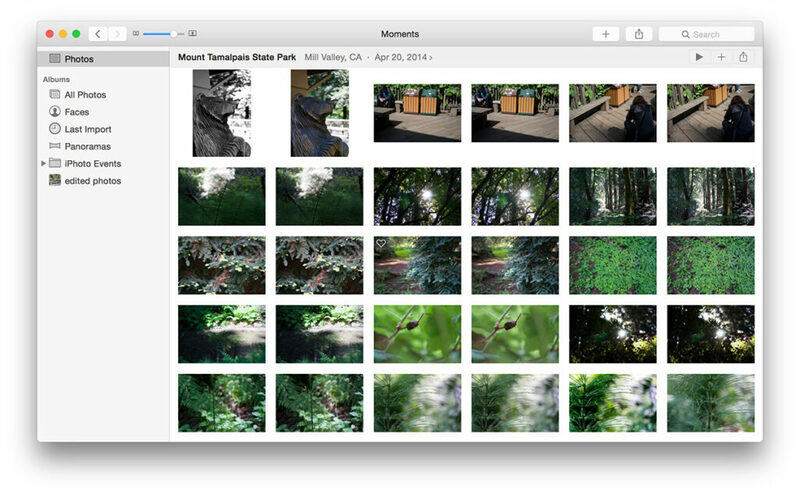 Scratches can make it impossible to read important data or cause noise in playback images. 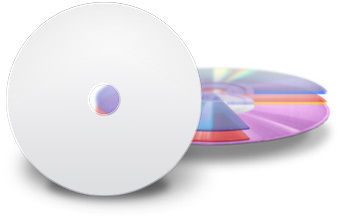 DIGISTOR discs uses a spin coating method to apply a hard coating of uniform thickness that protects the disc from scratches. More than 35 years in developing recording discs. Our Blu-ray Discs are manufactured in an integrated production plant in Japan where every process, from material development to final manufacturing, is performed. This enables a smooth flow of operations such as development, new technology assessment and mass production, and produces discs with extremely high levels of reliability.